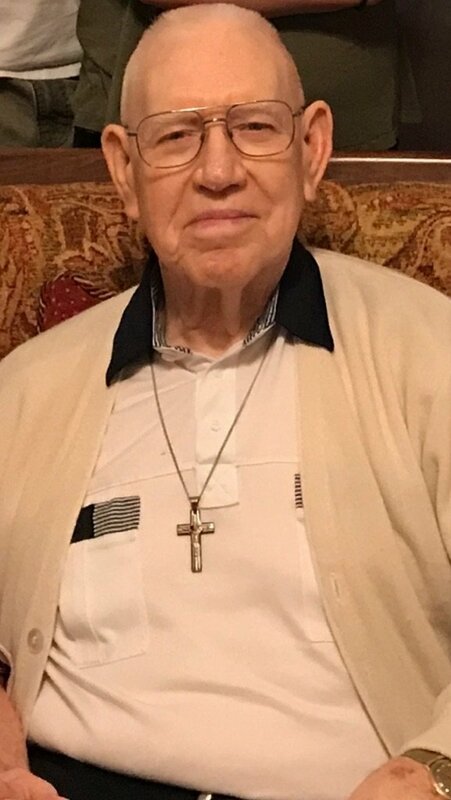 Edward Gene Orscheln, 92, passed away January 8, 2018 at North Delta Hospice House in Southaven, MS. He was born May 6, 1925 in Sturgeon, Missouri. He leaves his wife of 70 years, Norma Jean of Horn Lake, MS; one son, Gary (Sheryl) Orscheln of Columbia, MO; two daughters: Angeline (Terry) Calvert of Horn Lake, MS and Linda (JC) Willingham of Willard, MO; 5 grandsons: Eric (Belle) Orscheln of Moberly, MO, Sean (Rhonda) Calvert of Southaven, MS, Brent (Stacy) Calvert of Middletown, DE, Christian (Christina) Willingham of Platte City, MO, and Brian (Alfonso) Willingham of Orinda, CA; 3 granddaughters: Emily (Dustin) Rowland of Columbia, MO, Shannon (Curt) Mayo of Hernando, MS, and Callie (Jerry) Presley of Willard, MO; granddaughter-in-law Jennifer Orscheln; 20 great-grandchildren; 2 great-great-grandchildren. Gene was a very active member of the Knights of Columbus for over 70 years. He missed his senior year in high school when he joined the U.S. Navy. Gene was Seaman First Class, serving in WWII from 1943-1946. The family business was Orscheln Brothers Truck Line, naturally the young Gene began working at the age of 12 until he retired as the president. The funeral mass will begin at 11 A.M., following an hour long visitation, at Christ the King Catholic Church, 785 Church Rd W, Southaven, MS 38671, onJanuary 11, 2018. In lieu of flower, donations can be made to St. Jude or Shriners Hospital. Arrangements by Twin Oaks Funeral Home, (662)-349-9720 , 290 Goodman Road East, Southaven, MS, 38671. Gary & Family, my thoughts & prayers are with you at this sad time. We are sorry to hear about your loss. We are praying for Norma and family during this time.